Keep Your Tail Up, America! You remember that one time when America managed to elect a new president who is the equivalent of the reprehensible James Spader character from every John Hughes movie ever made? Yeah, well. Here we are. John Hughes is dead and there’s no re-writing a happy ending to this one. Duckie is not swooping in at the eleventh hour to save us. 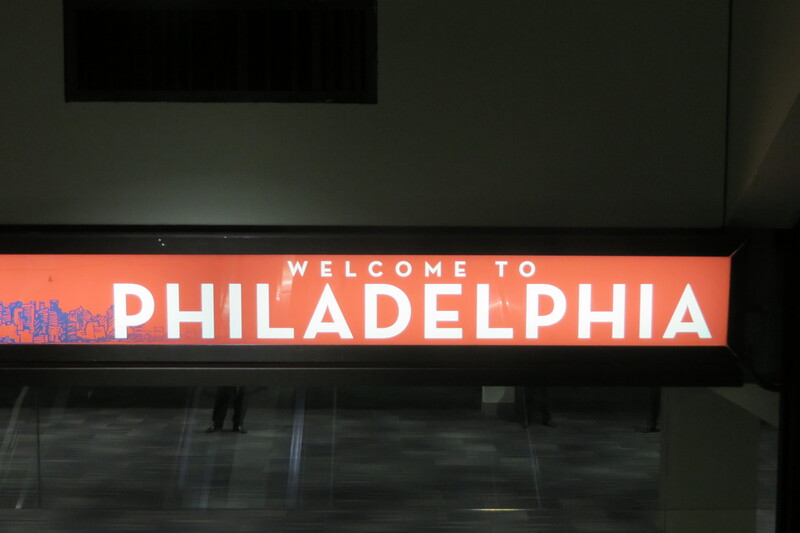 Z and I are in Philadelphia for a conference of his. Tuesday night, we were in Seattle packing for an early morning flight while the votes were being counted. Z had been so sure that Hillary would win that he hadn’t even conceived of an evening where she wouldn’t. He’d come home with a bottle of champagne and big smile on his face, even though the dominos were starting to fall. Because I’m female and I grew up in an era when girls were given their Title IX rights (no matter how capable and qualified they were, it would never be about them–the big game on Friday night was always only ever going to be for the boys), I was less sure. So I became the realist in the house a full two hours before Z did, which is a rare occasion—Z is always the one winding my big ideas in. The sight of him cheering what was clearly a losing race, at least electorally, made me cry even harder. One of Z’s more delightful characteristics is how much he loves this country. He’s obsessed with it. He’s ruined perfectly good lazy Sunday mornings in bed because it’s time to Meet the Press. He follows politics. He remembers names. He’s aware of processes I didn’t even know our government had, and he explains them to me regularly because I’m often distracted and can’t remember. Even today at lunch, he had to remind me why we call the press the Fourth Estate. I thought it must have something to do with William Randolph Hearst’s fancy house in California. I knew the election was going to disappoint him before he did. While my friends were texting me about how they didn’t know what to tell their kids, I was wondering how I was going to explain to Z that America really just wasn’t that into him. In fact, half of America would very much like him and his ilk to leave so it could see other people exclusively: mainly the white people who were born here. I am trying not to hold it against strangers who don’t know Z and voted the way they did, but I will admit, I am still struggling very hard with the ones who do know him, the ones who purport to delight in him, who made a similar choice. No one owes me or Z or anyone else (gay, female, disabled, minority, immigrant, whathaveyou) their vote, and I’m sure they had their reasons even though I can’t personally understand them. But by the same token, I’m not feeling like I owe any of them my graciousness right now. If you are here and suspect I’m some kind of whiny liberal cry baby who is speaking in hyperbole about how stricken I’ve been since Tuesday—an event that felt equal to my first heart break, or eerily reminiscent to how gutted I was when my father died suddenly in 2001, or only 12% better than the afternoon six years ago when I found out I had lymphoma—I assure you, I am not. This is not an issue of the Seahawks losing the Super Bowl. I’m not going to be over this any time soon. 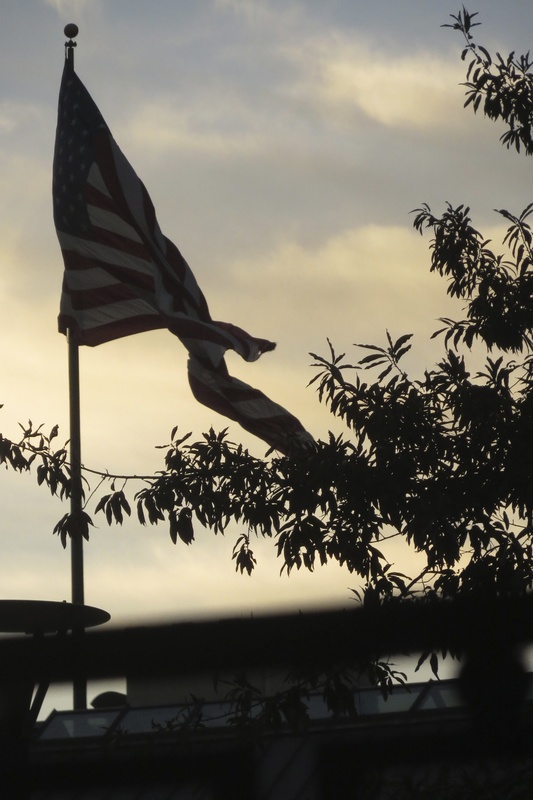 The American story I thought was being written is most definitely NOT being written now, and it is going to take time to reinterpret how to view the country we live in and the people we live with. 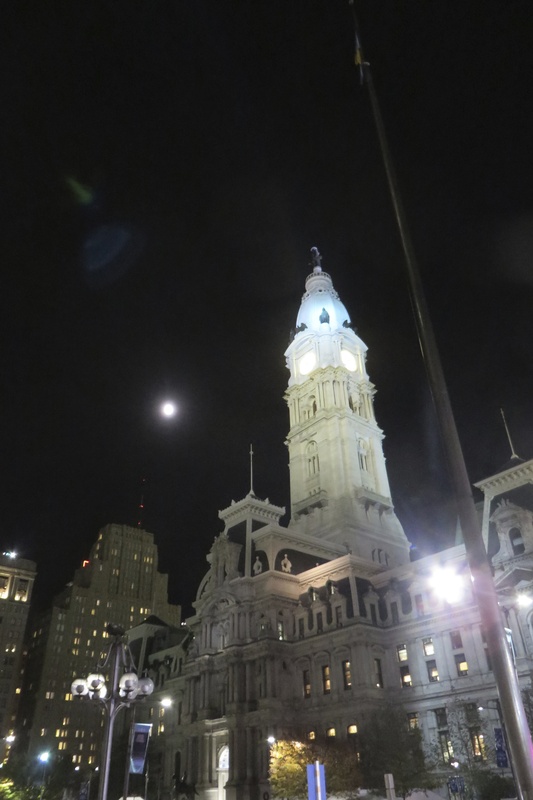 Suffice it to say, by midnight neither of us ever wanted to speak to Pennsylvania again, let alone Philadelphia—which had looked so promising on Monday night while Hillary stood near Independence Hall, sounding all gracious, capable and ready. If I’d known that by Wednesday morning I’d be flying over the Dakotas weeping loudly and snottily as I listened to her concession speech, I probably wouldn’t have gotten on the plane at all. It would have felt so much better—still awful, but better—to stay snugly wrapped in my blue state, feeling blue, surrounded by people who were feeling similarly disappointed. Several years ago, I was od-ing on episodes of Cesar Millan’s show about dog training. I had no dog of my own that needed training. I just liked having dogs in my living room, even if they were televised ones. I’d never train Cesar’s way because I don’t roller blade and I’m not comfortable with how much his dogs have to conform or be manhandled. But there was one episode I loved in which this really unhappy, anxiety-ridden little dog could not find her inner joy, no matter how much better her life was now that she’d been rescued. She was a mess, quivering and downcast. Cesar got the idea that since dogs that are content usually have their tails up, he’d tie her tail into an upright position to see if it would affect her mood. It looked ludicrous and the dog seemed both miserable and mortified now, her tail hoisted up like a furry sail. This will never work, I thought. But then, the next thing I knew, that little dog was holding her tail up on her own. That tail was wagging, and I swear, she was smiling. I like a story with a happy ending, especially a dog story, so I told Z about it. I assumed he’d forgotten about it, and then one day when I was feeling down, as he left for work he said, “Keep your tail up.” It became short hand between us whenever I was in the dumps or was anxiety ridden. Truth be told, I liked the indirectness of it. If he told me outright to “be happy” I’d probably remain miserable for the rest of my life just to remind him that I’m my own boss. But somehow, the notion of keeping my tail up seemed both an endearment from him and a proactive step that I could use to get out of the doldrums: do something. When I am upset or depressed, or in this week’s case, sad beyond comprehension, I am a proponent of sitting home and feeling my feelings. There is so much feeling I need to do some days that it is like a full time job. Z, on the other hand, errs on the side of doing. So yesterday—though I really did not want to because when I woke up in the middle of the night from a perfectly nice dream, the first thing my brain presented me with was a reminder that there was a president-elect and it wasn’t one wearing a white pantsuit—we did Philadelphia. Z started the morning with a conference presentation while I wrote in the lobby. 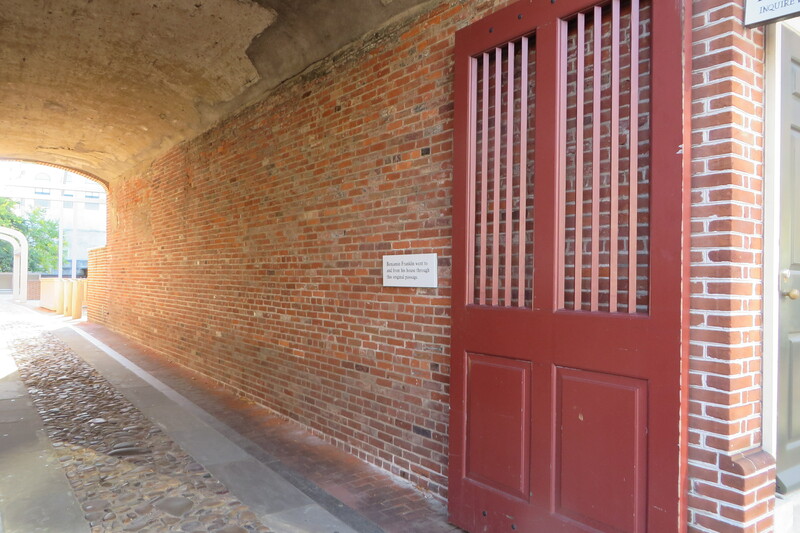 Then we walked: through an alley once frequented by Ben Franklin, past the place where Jefferson penned the Declaration, past Independence Hall, past the Liberty Bell. Ben Franklin walked here, and so did I. We made our way into Christ Church (“The Nation’s Church” where Revolutionary heroes once worshipped) and took in the simplicity of the sanctuary. We wiggled into a pew like congregants and settled ourselves. 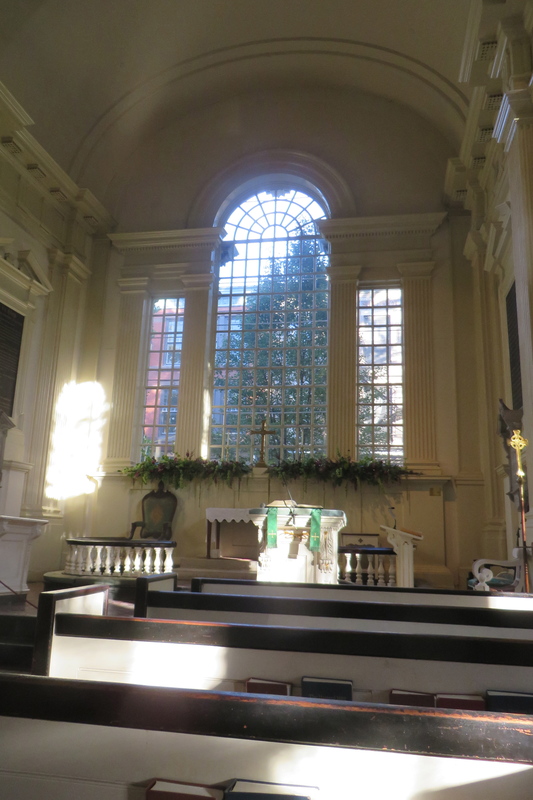 Up front, instead of a big altar and stained glass, there is a large window with clear panes of wavy glass that look out into the world, onto the idea of America. 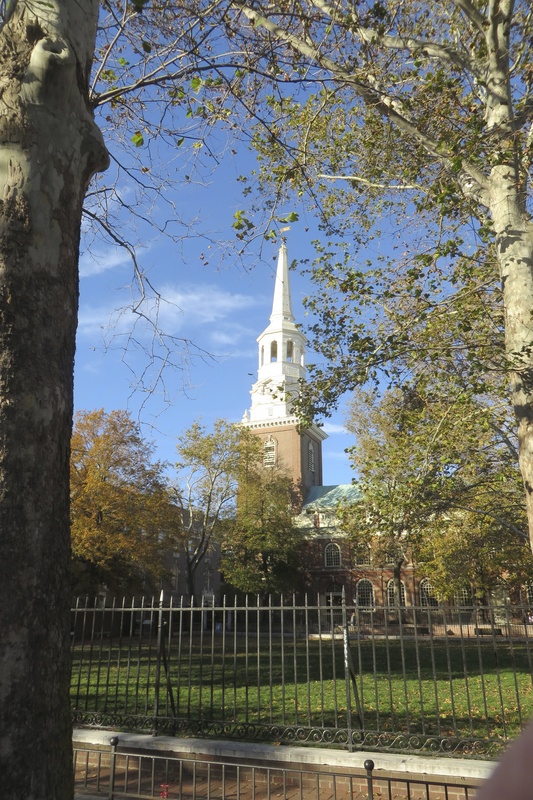 Christ Church, where patriots prayed. What do you do with your disappointment when there is nothing to actually do? The election is over. There are no do-overs. The 90 million people who chose not to vote who could have turned this ship around if they’d been inclined, stayed home. We have an electoral college, so there’s no declaring the day after that we’d like to abolish it retroactively because its results don’t align with the wishes of the populace sometimes. The night before, Z and I had watched the protests on the news while we ate hotel restaurant soup and I said, “But what do they expect to happen exactly with their chants and signs? It’s over.” Z shrugged. 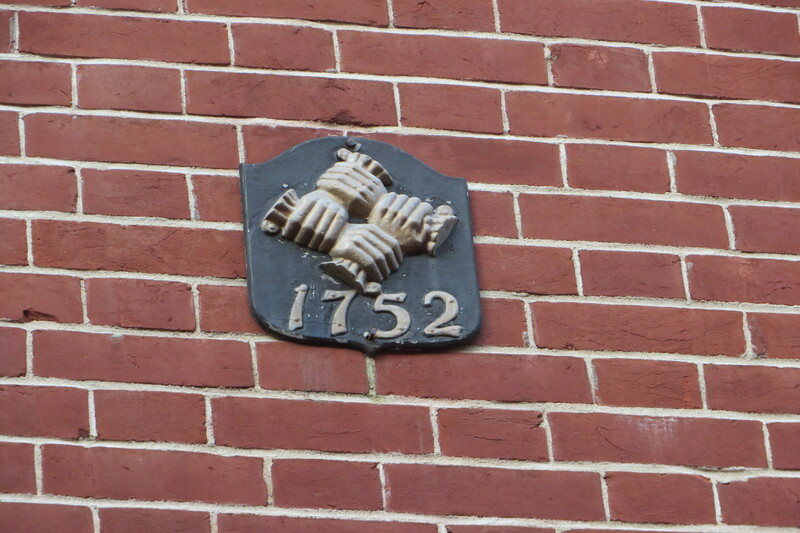 Back at the church, I wiped my nose on my sleeve and we went in search of Ben Franklin’s grave and Elsfreth’s Alley. 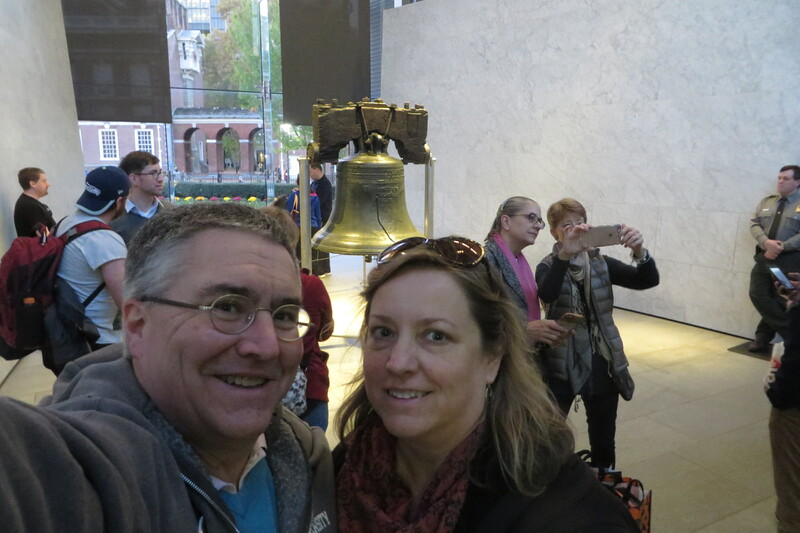 When you are in Philadelphia, these are the things you do and we weren’t done doing. Elsfreth’s Alley is a narrow, cobblestoned street with tall, narrow, be-shuttered houses that look exactly how you think all the houses in all of Philadelphia will look. 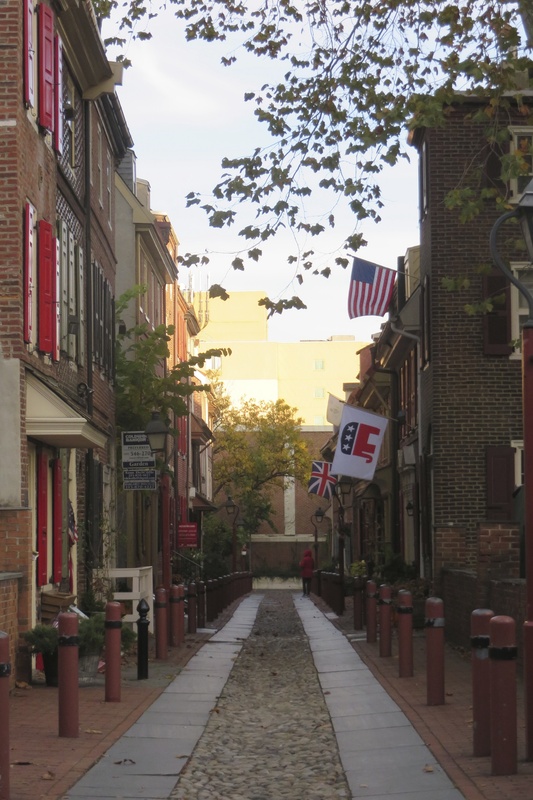 It is the oldest continuously inhabited street in the U.S., and it is not difficult to picture Ben Franklin swooping down it in his cape, wiping some steam off his glasses, maybe whistling or saying something off color or brilliant. 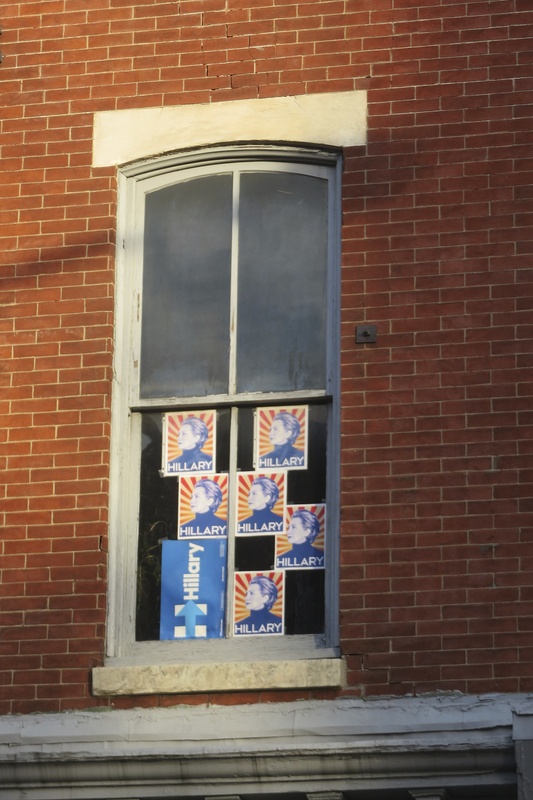 One of the houses had a massive Republican elephant flag flapping in the wind and across the street there was a house with Democrat signs plastered in several of the panes. This is what democracy has always looked like, I suppose. Neighbor opposed to the political ideals of neighbor. More is just spent on campaigning now. 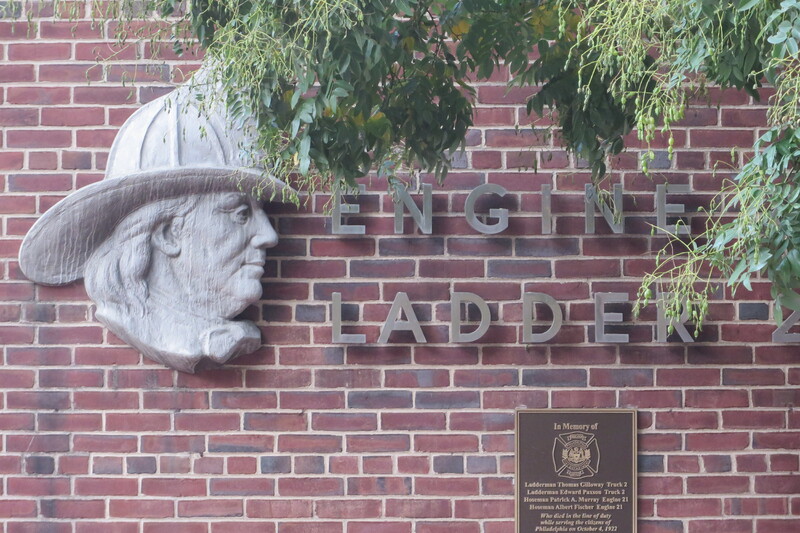 The cemetery where Franklin is buried was closed when we got there (though there is a fire station across the street with Ben Franklin wearing a firefighter’s hat, which was worth the walk). I poked my camera through the fence and took a photo of Franklin’s grave, which is not impressive nor is it singled out amongst all the other graves, alerting us to his greatness. It’s just a slab of marble with his name, his wife’s name and no epitaph. It turns out that he, like all the others buried there, was just a citizen. The puffy-eyed face of disappointed democracy. One of the placards that I did have time to read was about Oney Judge, Martha Washington’s personal slave, who, upon learning she was to be given as a wedding present to the first lady’s granddaughter, decided she’d rather run away. Imagine that. Presenting someone with an actual person as a wedding gift. Of course none of this made me feel better. The reason I can tolerate the ugly side of America’s history has always been my belief that we learn from mistakes and are perpetually becoming better about practicing those truths we supposedly hold to be self-evident. Our feet were tired, so we trudged toward the train station so we could head back to our hotel. As we walked up Market towards City Hall, helicopters were hovering overhead eerily. We kept looking and listening for some indication of distress, but there was nothing. 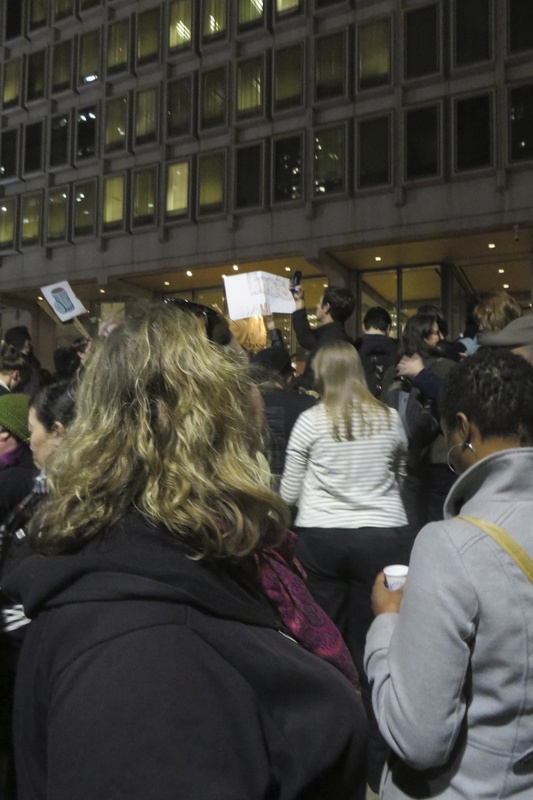 Because we live two blocks from downtown Seattle, we’ve become well versed in whether a helicopter is there because of an accident, a crime, or a protest. There are a lot of protests in Seattle. Z and I might be with the protestors in spirit—we might lean out our windows and wave them on—but we aren’t joiners. Crowds of any sort make me nervous, and if I hear a helicopter hovering, my response is often to check Twitter to see where the protest is happening and then skitter around to avoid it. Last night was different. My feet hurt and I was exhausted from our walking history tour, but my step quickened towards the City Building where I was sure we would see something worthy of the helicopters. We got to it and nothing. We looked around. Checked the phone to see if something was going on somewhere nearby, and then we heard a cheer on the other side of the building. For the first time ever, my initial instinct was not how can I avoid this but instead, how can I get there the quickest? I felt called. According to the president-elect, these are professional protestors. We dodged the rush hour traffic snarls and found ourselves in a crowd of a thousand or so who were ramping up for a march. 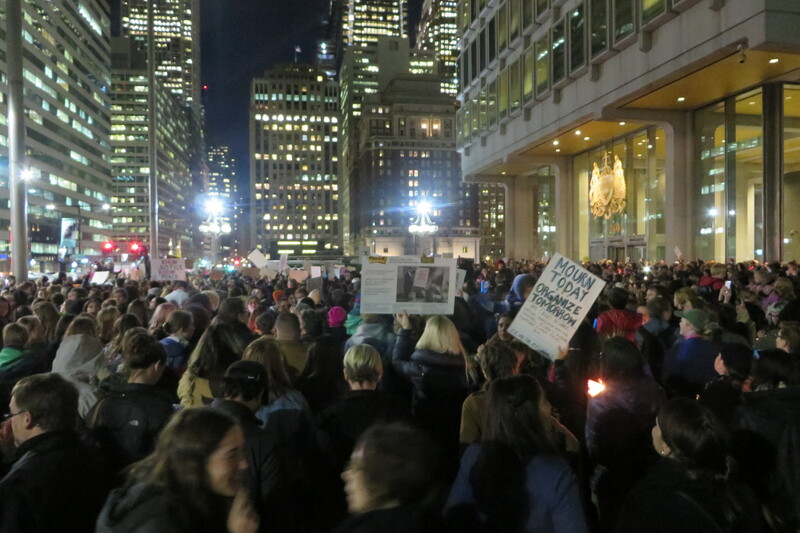 The signs were diverse: Black Lives Matter, gay rights, trans rights, abortion rights, and some fairly graphic signs suggesting the new president-elect should come to terms with the notion that women’s bodies are not up for grabs. The unifying theme: you may be the next president, but we will not tolerate your intolerance. Don’t judge me–democracy is at stake. I can’t be bothered to brush my hair! It felt good, standing there and claiming my first amendment rights for what felt like the first time. I didn’t have a sign, but I held my (figurative) tail up high and proud. Will it change what the next four years look like? It’s doubtful. But I will tell you this: I have never felt more American. It’s not the America I thought we were living in in Mrs. Turner’s 3rd grade class, that’s for sure. Tails up! I LOVE YOU, BETH. Let’s democratize. I love you too, Chickpea! I am in full-on democratization mode! As always, Beth, you manage to make me both laugh and cry in the same piece. Feels like some kind of poetic justice that you were in Philadelphia when you had to come face-to-face with the sometimes sad results of democracy! I’m going, Chris. And I’m not stopping. My tail feeling rather draggy, but I’ll try to remember this notion. I said the words “President Trump” on Thursday. Felt like I had a hairball in the back of my throat…..
Z and I almost wept in a Philly gift shop when we saw a picture with all the presidents in a line and it was just impossible to imagine his face there with the guinea pig hair. 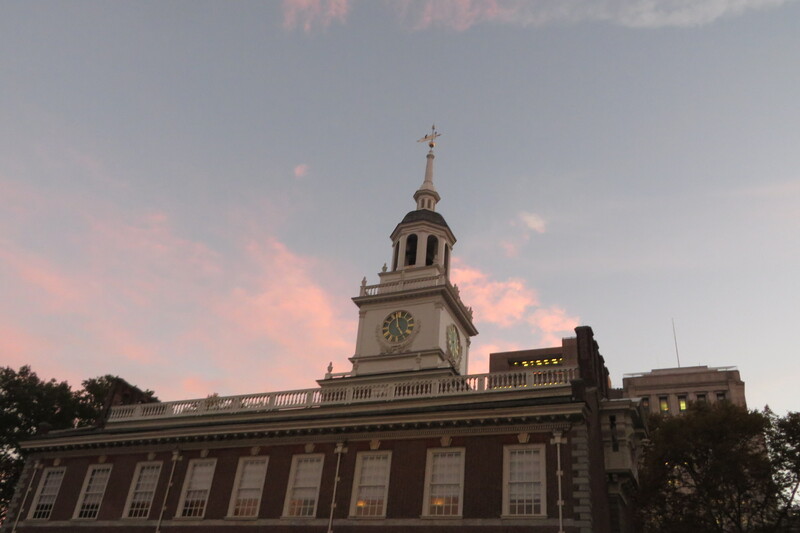 What an amazing experience to survey American history in Philadelphia on Election Day! Thanks for your story. It was actually two days after the election, but the election (and its results) were still palpable. Thanks for reading! Wow. I can’t even put a sentence together (my post-election gutful of rage, grief, and nausea makes me almost 100% incoherent) but you’ve written something so beautiful with a beginning, middle, and end that makes sense — SENSE — of these surreal events. I needed to read this — thank you. ebh09: I can’t even hold the word “Presdent” and ‘Trump” in my MIND, let alone actually SAY them. I seriously think I will never, ever be able to speak those two words together. I’ve never felt hatred like this, including when the Republicans and their Supreme Court lackeys stole the 2000 election, which I thought was the lowest this country could go. I was wrong. Vivian, I can’t wait until you are feeling coherent because I suspect you won’t be holding back at all in your blog, an dI will gobble up every delicious morsel!